This graphic -on display at the Grandview-Woodland Community Plan, Hastings Sub-Area Workshop on February 14th– caught my jaundiced eye. I find the choice of “gears” to represent the relationships between the community, city, senior levels of government, and developers to be an apt metaphor: mechanistic, kinetic but rigid and predetermined. That the community is depicted as having no direct influence on developers is a nice honest touch, however unintentional. Intentional? 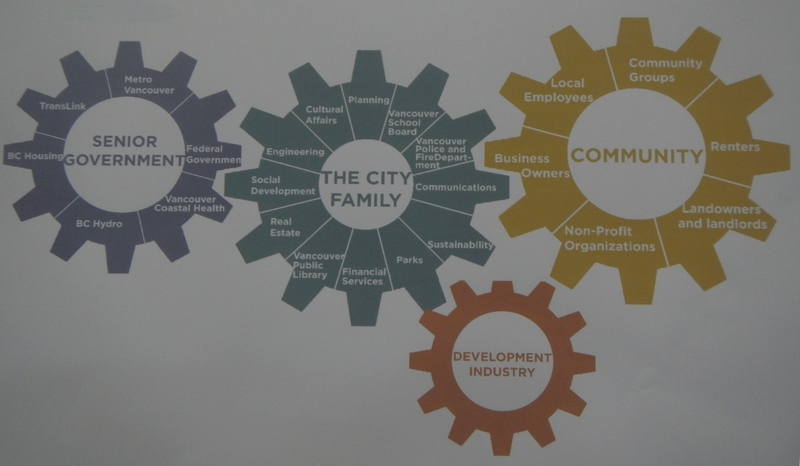 Labeling the civic gear as “the city family” also rings true, if I think of the traditional family structure (at least the ones I have suffered): paternalistic, hierarchical, unequal. In this particular scheme, that would leave Cultural Affairs as the runt, without substantive influence. Social Development enjoys a profile, sure, but occupies a rung below Real Estate and -in these spin intensive days- the loud-mouthed and superficial sibling, Communications. Planning, of course, is in charge -the pater familias, the master of the house. Circa 1960, Vancouver’s Planning Department was popularly known by city employees as The Foreign Service. “Service,” for they served the money. In the 1950s and ‘60s that was public money, federal cash earmarked for highways and “urban renewal.” Building the paper case for the improvement of Strathcona by bulldozer, this Service consisted of “windshield” surveys –the wholesale condemnation of housing stock conducted from the removed comfort of an automobile. (I picture a couple of toffs in an MG, marking tidy rows of Xs on a clipboard, and making pit stops for G & Ts.) And so, the modus operandi: an understanding defined on the Q.T., with legitimacy endowed via process and public farce. I open with a salvo aimed squarely at the bureaucratic minstrels. I do admire their thick skins. They nod dutifully at my complaints -the last minute distribution of information, the questionable blah blah- and promptly move on. Certainly, I try to be helpful. I suggest renaming the neighbourhood Treeless-Poorview, and I pounce on the proposal for a plaza at Hastings and Commercial as an ideal location to enjoy the downwind aroma of the waste reduction plant. Alas, my ideas fail to gain purchase. The corporation owns the entire north side of Hastings, from Clark to McLean. This includes the Waldorf Hotel. Mr. Bosa’s eagerness for a rezone and as much allowable height as possible + additional density for amenity is offset by the mute placards calling for the preservation of local heritage. Throughout the course of the day Mr. Bosa exchanges involved but sotto voce asides with the ranking planner, Andrew Pask. Scented or otherwise, I assume Mr. Pask left his handkerchief at home -or possibly the office. * I’m not inventing any of this. Heh, I’ve thought Hastings and commercial would be an awesome, very needed green space. Of course I understand the soil is likely contaminated… Though that didn’t stop them from putting that dodgy community garden in at burrard and Davie. No, I’d be hoping for a real park, grass, trees in the ground.. The kind that effectively clean the air and (hopefully) remove the odours wafting southward. The kind they don’t make anymore.